Night Of The Templar: A Medieval Knight resurrects to fulfill his vow and bestow a blood-thirst vengeance upon the kindred spirits of those who betrayed him long ago. In the course of one night, identities will be revealed, destinies met, and a poetic justice of the macabre maniacally served. Night Of The Templar can be found at Cannes on May 17. This movie has a dynamic star cast including: Paul Sampson (Lord Gregoire / Jake McCallister), David Carradine (Shopkeeper), Udo Kier (Father Paul), Norman Reedus (Henry Flesh), Billy Drago (Shauna the Chef), Max Perlich (Benoit the Butler), Nick Jameson (Lord Renault), Jack Donner (The Grand Master), Ingrid Sonray (Amy), Lisa Gleave (Ashley), Sofie Norman (Celine), Mary Christina Brown (Japoniko), Hrach Titizian (Melkon), Assaf Cohen (Menas), Gregg Lederman (Koko) and more. This is David Carradine’s last movie. Paul Sampson actually acted, directed, wrote and produced this film. Talk about a lot of hard work! Check out more info on the movie database: http://www.imdb.com/title/tt0768222/combined + the photos and media on the Official website: http://www.nightofthetemplar.com You can also follow on Twitter and ‘Like’ on Facebook. 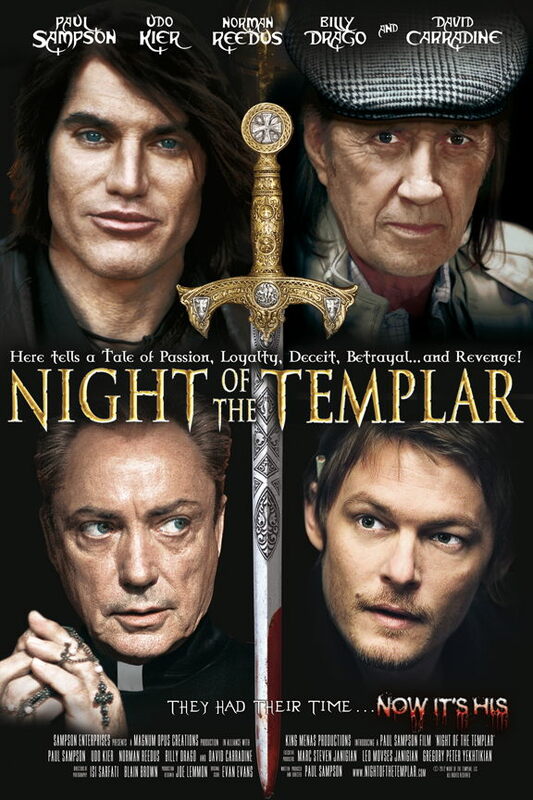 There are currently 2 Comments on New Night of the Templar Poster And Showing At Cannes. Perhaps you would like to add one of your own? I seriously need this movie in my life. At first I was just excited because Norman was in it but then I read the summary and I was immediately in love with the premise, it’s so original and cool! Please, please, please let it be released on DVD soon, I can’t continue living if I don’t see it in the near future. .